Coming winter of 2018, the All-new 2019 Rav4 is sure to excite. The vehicle that created the entire small SUV market gets a top to bottom make-over for its 5th generation. With a chiseled appearance on the new TNGA platform, the Rav4 will emphasize Adventure and refinement. Bolder and tougher, lower and wider with a longer wheel base and wider tracks give it a more stable and confident drive. Shorter front and rear overhangs will aid in Off-road prowess as well. 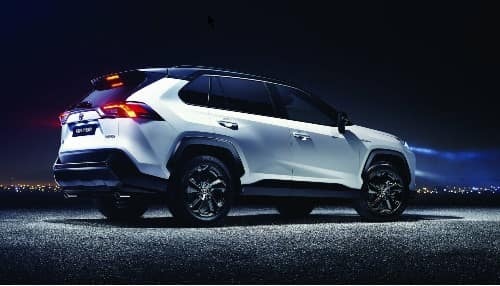 Increasing chassis rigidity by 57 percent and incorporating a multi-link rear suspension, the 2019 Rav4 will provide ideal damping and handling, minimize interior cabin noise, and improve ride comfort. Even with ground clearance being increased by more than a half inch, the RAV is able to improve its aerodynamics. Still available in either gas or hybrid power trains, the Toyota Rav4 will add a sportier model in the XSE Hybrid. True Off-Road Capability will be added with available Multi-Terrain Select and Dynamic Torque Vectoring All-Wheel Drive. Advanced Electronics will include: Apple Car Play, Toyota + Alexa, Available 8″ touch screen, up to 5 USB ports, and an available 800 Watt 11 speaker JBL sound system. Of course Toyota Safety Sense 2.0, the latest and greatest safety suite will be standard as well.